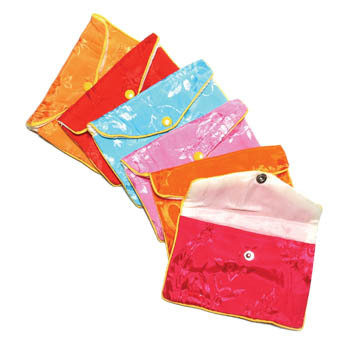 Now $4.50 dozen (regularly $5.00 doz) Genuine silk Chinese pouches in assorted brilliant colors with snap closure. 5-1/2" x 3-1/2". While they last! Pack of one dozen Snap-close Silk Jewelry Pouches, 5-1/2" x 3-1/2". This item is IN STOCK while supplies last, and ready to ship.